Lately, I've been in a very romantic bohemian mood when it comes to interior styling. Maybe it has to do with a new heartmate and exploring new places ;) And when I say romantic bohemian, I'm not talking about heart motifs or shades of red, although, I do love me some touches of pinks in a home. I'm more about a masculine romance. 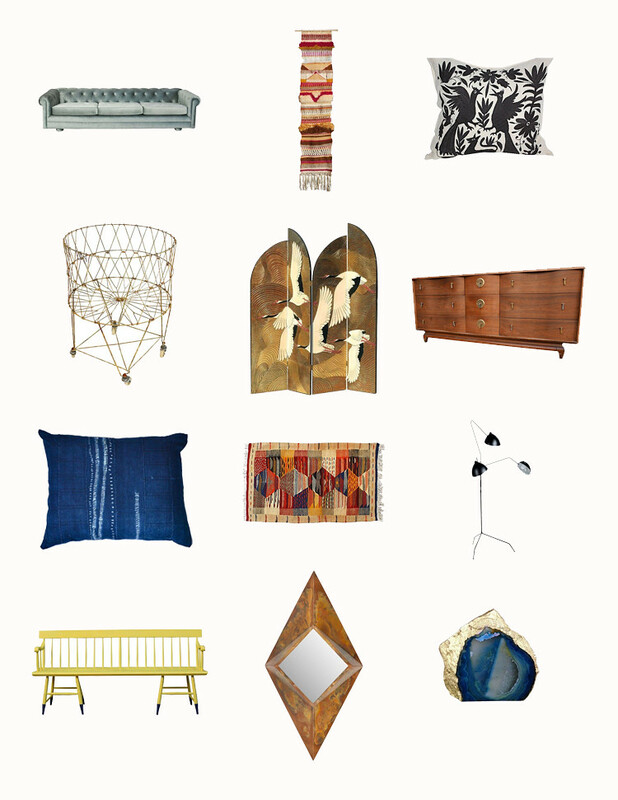 Mid-century modern and art-deco to keep it masculine. Mix that with Victorian colors in pink, yellows and blues. Combine it with art nouveau whimsy like images of nature, animals and birds. And then layer it with some global textiles, like a Moroccan rug. Does that make any sense? Ha. Ha. And you know where's a great place to find all of that? Chairish! I recently partnered up with them to create a collection of some of my favorites. You should hop on over to see the rest of my collection. I'm salivating over everything. Chairish is my new favorite online vintage shop. It's a great place to buy and sell vintages pieces. And not just to shop, you'll discover amazing works from designers you've never heard of, which you can research more about. They also have an online app to make selling and buying even easier. I'm definitely gonna sell once I start thrifting again. Above are just my 12 favorites at the moment. The Serge Mouille Reproduction Floor Lamp has been on my wish list for about five years now and that's such a good deal. I hesitated just a little putting it up! And that playful Yellow Windsor Bench! This would work marvelously in an entry way with an African Indigo Pillow and with some art hanging above it. And who knew a French Wire Laundry Basket could be so glamourous. It could also be great for storing throws or even as a plant stand. I can go on and on about each and every one of these pieces, especially the Gold Leaf Japanese Crane Screen which would make any bedroom amazing. And to complete the this whole romantic bohemian look, you're gonna need plenty of plants, like a paradise palm tree! Alright, my vintage vultures. Check out the links to all the goodies below! This post was created in partnership with Chairish. Sweet thanks!